Steve , in whistle and flute, at the leaving party for Peter Holt, Bristol council’s director of communications ,held at City Hall. 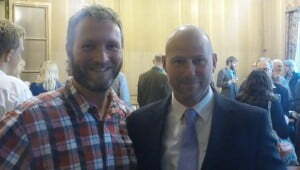 The chap with me is councillor Gus Hoyt, executive member of the council for green spaces and neighbourhoods. Last Friday evening , I had the pleasure of attending the leaving party held for Peter Holt, Bristol council’s Director of Communications ,held at City Hall. It was a rare occasion for me to appear in a suit instead of my usual gear!